This blog was created to share my genealogy research journey with my family and the world. It contains the genealogy of the UNDERWOOD, AHERN, McCORMACK, and STAPP family lines. All are invited to linger. Line 8: Elliott McCormick, head, home rented for $11.00, radio on premises, residence not located on a farm, male, white, age 34, married, age 21 at first marriage, did not attend school this year, can read and write, born in Iowa, father born in Iowa, mother born in Iowa, speaks English, salesman in gas filling station, wage or salary worker, employed, not a veteran. Line 9: Dorthea McCormick, wife, female, white, age 33, married, age 21 at first marriage, did not attend school this year, can read and write, born in South Dakota, father born in Illinois, mother born in Denmark, speaks English, no occupation listed. Line 10: Carol McCormick, son, male, white, age 10, single, attended school this year, can read and write, born in South Dakota, father born in Iowa, mother born in South Dakota, speaks English, no occupation listed. Line 11: Corinne McCormick, daughter, female, age 2 and 10/12, single, did not attend school this year, born in Iowa, father born in Iowa, mother born in South Dakota, babies are not listed as being able to speak English, no occupation listed. 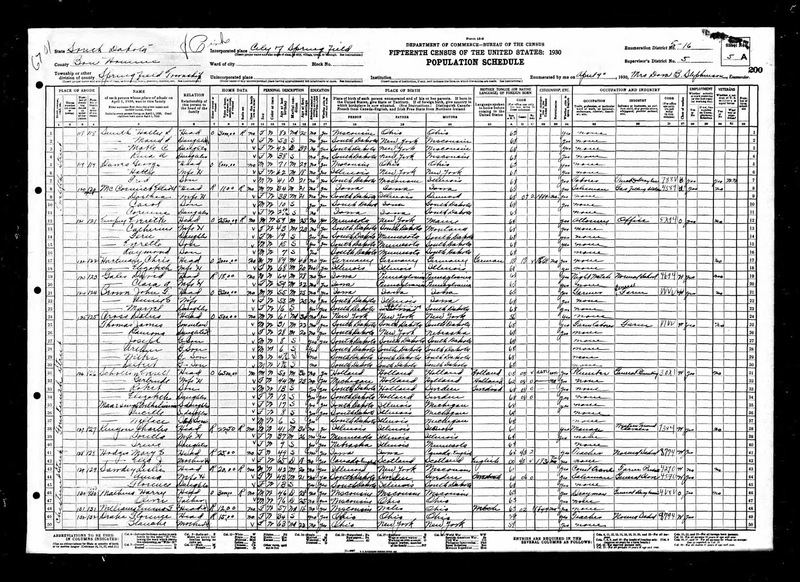 1930 U.S. census, Springfield, Bon Homme, South Dakota, population schedule, City of Springfield, enumeration district (ED) 5-16, sheet 5A, stamped 200, dwelling 120, family 120, Corinne McCormick; digital image, Ancestry.com (https://www.ancestry.com/interactive/6224/4547346_00408/110897792?backurl=https://www.ancestry.com/family-tree/person/tree/17747247/person/549860878/facts/citation/74366310433/edit/record : downloaded 3 March 2019); National Archives and Records Administration, microfilm series T626, roll 2217. 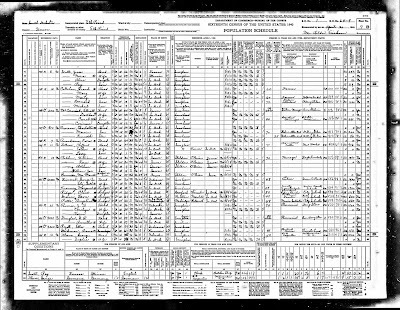 See Corinne in the 1930 U.S. Census. You must be logged in to Ancestry.com. Coming Up Soon: Ahnentafel #4: Introducing My Paternal Grandfather, Stephen Alexander UNDERWOOD, Sr.
Line 50: Elliott McCormick, head, male, white, age 44, married, home owned free and valued at $200, did not attend school this year, attended school through grade 8, born in Iowa, lived in same house in 1935, employed for pay, worked 99 hours during the last week, station manager in his own [service] station, worked 52 weeks last year, received income from other sources. Line 51: Dorthea McCormick, wife, female, white, age 43, married, did not attend school this year, attended high school through fourth year, born in South Dakota, lived in same house in 1935, not employed for pay, did not do public emergency work, not seeking work, no employment history, homemaker, zero weeks worked in last year, no income from other sources. Line 52: Carol McCormick [absent], son, male, white, age 20, single, attended school this year, attended college through first year, born in South Dakota, lived in same house in 1935, employed for pay, worked 40 hours during the last week, assistant manager in H.O.L.C. tax division, wage worker, worked 30 weeks last year, income was $631, no income from other sources. Line 53: Corinne McCormick, daughter, female, white, age 12, single, attended school this year, attended through sixth grade, born in Iowa, lived in same house in 1935. 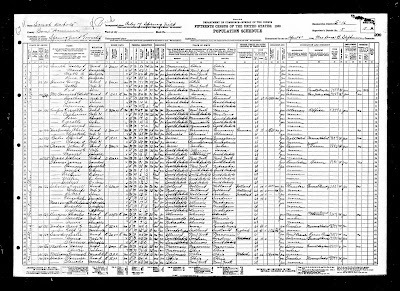 1940 U.S. census, Elk Point, Union Co., South Dakota, population schedule, town, enumeration district (ED) 64-9, sheet 7B, dwelling 146, Corinne McCormick; digital image, Ancestry.com (https://www.ancestry.com/interactive/2442/m-t0627-03869-00178/111323499?backurl=https://www.ancestry.com/family-tree/person/tree/17747247/person/549860878/facts/citation/74366310045/edit/record : downloaded 25 February 2019); National Archives and Records Administration, microfilm series T627, roll 3869. 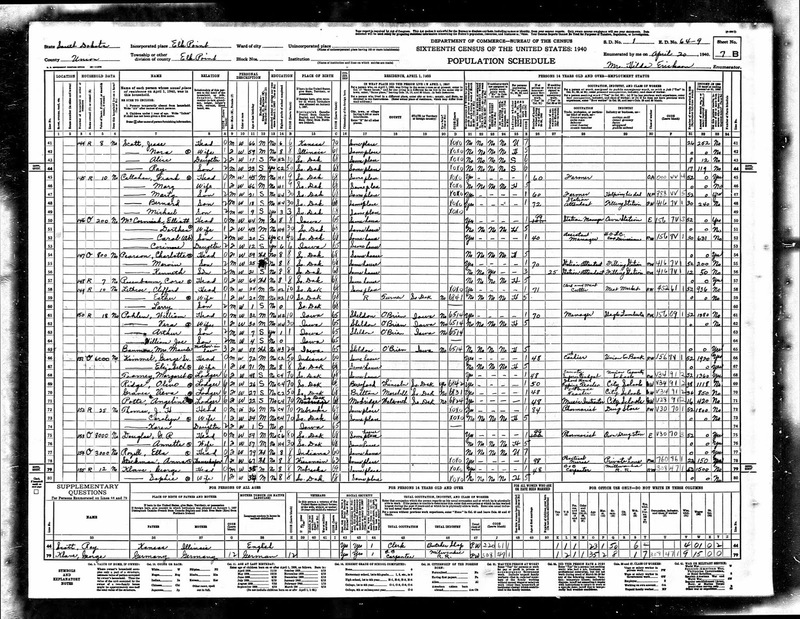 See Corinne in the 1940 U.S. Census. You must be logged in to Ancestry.com. Corinne lived many places in her life. Her 1940 and 1930 census locations will be coming up in future posts. Corinne lived with her daughter Christy who was her full-time caregiver. Corinne and Steve lived with Christy while she went back to college at UMKC. Corinne, Steve, and Christy; their son Doug may have lived there also. Corinne and most of her family: Steve, Greg, Doug, and Christy. Their son Pat may have been in Vietnam already. Their daughter Kathy may have been in Columbia, Missouri, attending Mizzou. Corinne and Steve lived with their four eldest children: Pat, Kathy, Greg, and Doug. Christy would be born the following year. Unknown—this home did not have a house number, Corinne said. It was located by my grandfather’s service station on U.S. 71 Highway. Visiting, but not living there: The census’ official date was April 1st. The family was visiting Corinne’s parents for her father’s birthday on April 2nd. They may have been enumerated on the census in South Dakota. Like I said in the “Of Census Predictors and Custom Facts” post of 31 Jan 2019—this family could be anywhere! Ergo, the Census Predictor. My name is Christine Jane Underwood, but you may call me Christy. It is a pleasure to make your acquaintance as you peruse my genealogy blog. I am just getting started anew in 2019 as part of my New Year's Resolution to get back into my family history research. I recommend that all new readers of my blog be sure to read the posts in January 2019 as they will explain some of what I am trying to do with this Web site. I look forward to hearing from you. My email address is christine.jane.underwood(at)gmail.com or you may post a comment. Thank you! Citing sources can be a real bugaboo for researchers, so I'm going to try and make it simple. You may copy and paste the below citation formula into your genealogy database program, changing the dates and post titles as needed. Remember, only uncool people fail to cite their sources. This is the blog citation format from Evidence Explained: Citing History Sources from Artifacts to Cyberspace: Second Edition, edited by Elizabeth Shown Mills in 2009. Author, "Post/Article Title," Creator of Blog, Blog Name, Posting Date (URL: accessed Date), Specific Content. EXAMPLE: Christine Jane Underwood, "Ahnentafel #1: Who I Am and Why I Am Writing a Blog," Christine Jane Underwood, Shaking My Family Tree, 15 January 2019 (https://www.shakingmyfamilytree.com/: accessed 16 January 2019), para. 1. Copyright © 2019 Christine J. Underwood, Kansas City, Missouri. Watermark theme. Powered by Blogger.